Halfway there. Halfway there loves. To get us started to the finish of line of this week, we have Alison from My Little Happy Place sharing her favorite room with us this week. Ooooohhhhh (sounds of wonder and amazement). Alison adores color and pattern which makes us adore her. Her house is an absolute designers masterpiece and dream. We cannot wait for her to showcase her favorite space, her living room. Alison, you are up! Thank you to the Lindsay's for having me! For any of you whom I haven't met, I am Alison from My Little Happy Place and I am a Native Texan living in Brazil with my husband and two daughters. Living outside the US creates many challenges AND opportunities for design, since I can't run to my nearest antique or resale shop, much less a HomeGoods or Target! Needless to say, it has given me a great appreciation for the idea of making the most of what you have, but being fearless in creating what you want! I chose our more formal living room as my favorite space. I recently switched out the khaki slipcovers to white on our ikea sofas, and "hacked" an old media cabinet with high-gloss paint and new hardware. A blogger friend sent me a sample of Hague Blue so I could have it matched. See, where there's a will (and a willing compadre!) there's a way! 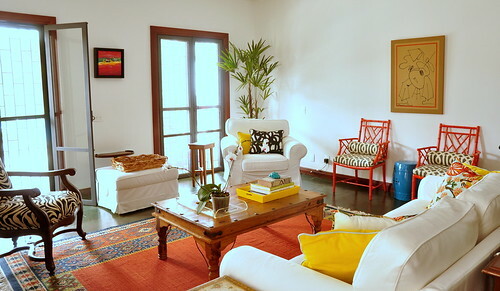 I love the way the sunlight streams into this room in the morning, and that it reflects our colorful and casual life down here in Brazil! Gorgeous room! 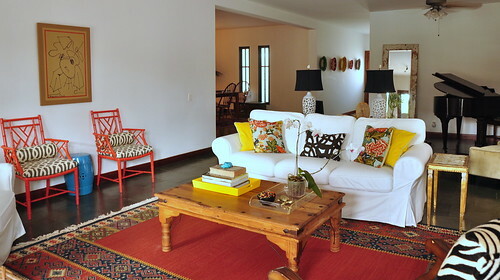 I love those red bamboo chairs and rug! I love this room! It looks fabulous! love the bamboo chairs! just discovered your blog and love it! I love the pops of yellow in the room! And the media cabinet turned out great. 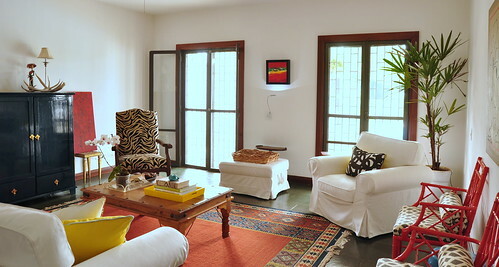 A bright, happy room! LOVE Alisons family room! I am so jealous she gets to live in Brazil, what an awesome place for her kids to grow up! The room looks beautiful, it's such a bright and happy room to boot. I love the colors she used. P/S: Come by and enter my current giveaway for a chance to win a $50 Kirkland's gift card if you like! Oh that pattern mix and bold colors are fabulous! Dying over the rug well done! That's a lovely room.I love the sunshine, too. so pretty! can't believe I haven't commented on this space before. it's so refreshing! We love Cozamia + Cozamia loves you = Giveaway. We heart... and a giveaway reminder!